Excerpted from “Chapter Five” from Words In Your Face: A Guided Tour Through Twenty Years of the New York City Poetry Slam by Cristin O’Keefe Aptowicz, founding board member of P4. In 1985, a retired construction worker and poet named Marc Kelly Smith was running a reading series in Chicago’s Get Me High Lounge. The poets who frequented the Get Me High series were offbeat and eclectic, and Smith, as the ringleader and host, wasn’t afraid to step away from the mic and deliver poetry directly to the people. But despite his best efforts, Smith still felt that the series was a bit of disappointment. He thought the poets weren’t being challenged by the audience, the audience wasn’t being challenged by the poets, and the element that suffered the most was the poetry. And if there was one thing that Marc Smith wanted, it was damn good poetry. Smith was and is a commanding figure on the scene. He is tall and solidly built with a strong square jaw, with shoulder-length steely black hair that is often pulled back into a tight ponytail. When he is smiling, his black eyes glitter mischievously over perfectly straight white teeth. When he is not smiling, the effect can silence a room and make poets tremble in fear. Smith realized the opportunity to create something new and different. 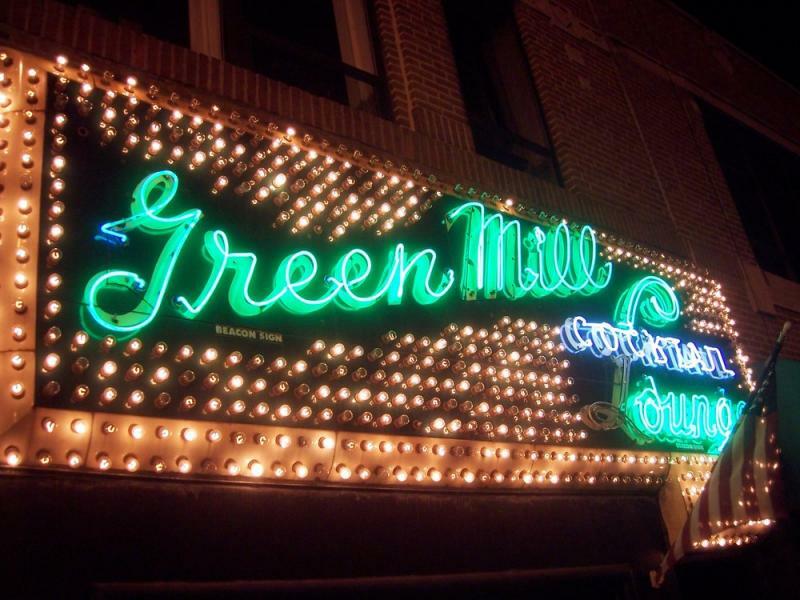 The Green Mill was a gorgeous old speakeasy located in Chicago’s uptown theater district. Dark but inviting, large but well-proportioned, the Green Mill was the perfect place for live performance that thrived on interaction. And so Smith set about creating a way to breathe life into the standard poetry reading: a format that would engage the poets and the audience. On July 25, 1986, the Green Mill hosted its first “Uptown Poetry Slam,” and the cultural movement was spawned. Smith took the stylized performances and high-energy rhetoric of his original Get Me High series and put it in context of a head-to-head, king-of-the-hill style competition. Rather than have other poets or even selected “experts” judge the poems, the poems were judged by randomly selected audience members. Unlike the modern day slam, which uses five judges and drops the highest and lowest scores, the early slam had only three judges, and whatever they said stuck. An avid sports fan—the name “slam” was lifted from the baseball term “grand slam”—Smith knew that competition had the potential to bring out the best in poets and engage an audience of people who otherwise couldn’t care less about poetry. Furthermore, the format directly counteracted the things that Smith disliked so much about traditional, academic open-mic poetry readings: the poets who signed up to read only to leave as soon as they were through performing; the bewildered, detached audiences that didn’t really have a way of expressing their reactions to the poetry being performed; and finally, and perhaps most crucially, a poetry written as if it were only meant for some upper-class Other. In creating the poetry slam, Smith created a community experience. Taking poetry out of the equation for the moment, consider what a poetry slam is at its core: an event wherein, if someone has something to say to the community, that person has the opportunity to stand up and say it. At a time before the internet became prevalent, here was an opportunity to sound off about grievances or celebrate personal triumphs and feel that you were actually being heard. It was a town hall meeting with a twist. And, with random strangers—and not the academic elite—as judges, poetry was given back to regular people. Smith further brought this point home by encouraging audiences to respond vehemently to the poetry being performed. If you loved the work, you had better cheer. If you hated the work, you’d better boo. The early years in Chicago saw poets with bulging portfolios experiment with their performance styles: they “gyrated, rotated, spewed, and stepped their words along the bar top, dancing between the bottles, bellowing out the backdoor, standing on the street or on their stools,” as Smith notes in his 2004 book, The Complete Idiot’s Guide to Slam Poetry. In Smith, the poetry slam could not have picked a better leader. Smith was and is the embodiment of anti-shtick. As the media attention increased, the poetry slam could easily have devolved into a cheap fad, but Smith kept true to his vision of poetry. Despite the focus on the slam portion of the evening, Smith retained both the traditional open mic and the “featured poet” slot in his line-up, a pattern that most poetry slams still follow today. The logic in maintaining these aspects that complement the poetry slam is evident in the effect they have. The open mics allow newer poets to test the waters of performance without having to face the intensity and scrutiny of the slam. Similarly, they allow members of the broader poetry community to perform pieces that wouldn’t necessary work in the slam, such as poetry that uses musical accompaniment or poetry that runs longer (or dramatically shorter) than three minutes. The “featured poet” slot serves many purposes. For those venues that allow local poet bookings, the featured poet slot rewards a hard-working slammer whose breadth and quality of work can now sustain a half-hour spotlight. For those venues that focus more on bringing in out-of-town poets, the featured slots give organizers the opportunity to showcase poets whose styles or approaches to poetry might be vastly different than those on display at the slam. My home venue of NYC-Urbana books out-of-town poets exclusively, for this very reason. We believe that the featured slots allow us to correct our community’s imbalances. If we notice that our regular poets are relying on their performance skills as opposed to craft, we will bring in poets the community may never have seen before, who can fully embrace the page and the stage. If we notice their ranting has all taken on the same loud, unoriginal quality, we can bring in a feature who experiments with musical approaches or isn’t afraid to whisper poems. While certainly these poets can be found locally in a poetry scene as diverse as New York City’s, our theory is that if our poets are too lazy to experiment by going to other readily available local readings or series, we aren’t going to reward their laziness by bringing these poets to them! The featured slot also had the unintentional effect of creating a poet’s economy in the slam scene. As the poetry slam scene developed, and more and more poetry slam venues were started throughout the country, poets who wanted to take their act on the road could now book tours exclusively at slams. Although venues could not afford to pay features much (usually $40-$60, with some venues going up to $100 or more, and others relying solely on pass-the-hat), few wanderlust-infected slam poets could resist the opportunity to perform in front of raucous slam audiences in tours that could last months as slam’s popularity increased. This development allowed for much cross-pollination among scenes and made our oft-talked about “national community” feel very real. Smith… was a benevolent ruler over his scene—generous to those he thought were in the poetry slam for the right reasons and icy to those he thought were reaping the benefits without putting in the work. He believed in the opportunity the poetry slam provided and worked hard to create and maintain an aesthetic he could feel proud of: poets and poetry he thought would stand the test of time. Smith was also eager to introduce and encourage responses from the audience, so that the poets knew exactly what the crowd thought of them. The Smith-inspired idiosyncratic elements of the Chicago slam include the “feminist hiss” (hissing if the poem smacks of sexism), the “masculine grunt” (the male response to the feminist hiss), and the aforementioned “Beatnik snap” (in which a bored audience has the opportunity to “snap” a poet offstage if they feel that the poem has gone on for too long). The latter response proved especially confusing to touring poets from the northeast, where snapping your fingers at the poet indicates that you like what you are hearing.